The income proposition for Herbalife and other multi-level marketing companies is the engine that drives the business. It is presented as real by major authorities, for pay, and without evidence. In reality, Herbalife and other MLMs offer zero opportunity. Loss rates among new recruits are, effectively, 100%. The MLM income promise is part of a monumental deception. HLF engages in deception in the promotion of its income proposition on such a scale, and in so many ways, the FTC has abundant regulatory means to cripple its recruiting. The primary tool of deception used by Herbalife, Nu Skin and other MLMs is the "income disclosure statement." Eight measures are used in MLM disclosures to present a false picture of "income opportunity" and to conceal the reality of zero chance for new recruits to make a profit. Even in the fog of hedge-fund warfare over Herbalife (NYSE:HLF), verifiable truth is still critical to the investor community for guidance purposes. It is surely not acceptable, for example, that reputable fund managers would support a known Ponzi scheme, purely on the bases that federal regulators took no action, the public was unaware, and the fund "grew." And surely analysts are not proponents of the view that a lie becomes truth by being repeated often enough or can be so big no one in authority dares acknowledge it, making it "true." Toward truth-based guidance, then, this article addresses the truth about "multi-level marketing" - MLM - companies like Herbalife. The analysis is not directed at merely deceptive marketing practices, but at the very foundation of the business contained in its Main Street financial prospectus, known as the "income disclosure." Specifically, it is my conclusion, for which I will offer hard evidence here, that the major multi-level marketing companies, such as Herbalife and Nu Skin (NYSE:NUS), among hundreds of others, are engaged in appalling and calculated cover-up, diversion and deception regarding the "income opportunity," in which they solicit millions of people to invest. This "income opportunity" is the engine of their businesses, making deception not just a marketing practice, but the very mission of the enterprise. In April a new documentary film premiers at the Tribeca Film Festival in New York City. It is about hedge fund Pershing Square's billion-dollar "short" investment based on the thesis that, for shareholders, the true value of Herbalife's stock value is zero. It is entitled, Betting on Zero. This title could also refer to the millions of people who stake their hopes, dreams and futures on the value of Herbalife's "income opportunity." Zero is the value of that "opportunity" and zero profit is what the "last ones in" receive. The MLM income opportunity does not exist. Claiming it does exist, or, as it commonly depicted, the greatest income opportunity in the world, is the proverbial "Big Lie," historically described in Wikipedia as "so colossal that no one would believe that someone could have the impudence to distort the truth so infamously." This deception in MLM is inherent and so pervasive that it is possible the FTC has no category for it and therefore has great difficulty seeing it when applied to what it officially treats as "legitimate business." However, once recognized, deception on this scale provides the FTC abundant grounds for regulating "MLM." It is the thesis of this article that the FTC, now with mountains of detailed evidence at its disposal, can find numerous areas of egregious deception perpetrated by Herbalife, sufficient to do major regulatory damage to the company. The regulation can cripple Herbalife's ability to continue selling a non-existent income opportunity, which currently sustains the enterprise. This option is available to the FTC even if it evades the issue of "pyramid scheme" or politically crafts its actions to avoid directly indicting other MLMs. MLM Income Disclosures: The Investment "Prospectus"
Without addressing the pyramid scheme factor, my assertion about this staggering level of deception is grounded in a tedious reading of the onlypublished documents consumers can turn to do due diligence on the MLMfinancial proposition, the MLM "income disclosure" statements. The income disclosures serve as the financial prospectus for the MLM investment proposition offered to tens of millions of Main Street consumers year after year. No MLM is required to provide a prospectus when it solicits investments in the USA. The FTC, under Consumer Protection Bureau Chief David Vladeckexempted all MLMs from making any disclosures. Yet, for court-related or precautionary reasons, many MLMs do, including several of the major MLMs such as Herbalife, Amway, Nu Skin and USANA (NYSE:USNA). Their methodologies are the model for all others. Most MLMs take advantage of the legal exemption granted by the FTC and don't bother with disclosure trickery. They rely on absence of facts to support their recruiting promises. Avon (NYSE:AVP), for example, offers no historical income information to USA consumers for its "business opportunity." Same for Tupperware (NYSE:TUP) in the USA, but it does in Canada, as required by law there. Tupperware's Canadian disclosure, when organized into readable data, reveals that the bottom 99% of its Canadian sales force received on average $11.49 per week, before expenses, and two-thirds of all annual commissions are awarded to the top 6%. Similarly, ACN, the MLM famously endorsed by Donald Trump, offers nothing for USA participants, but does offers an "average income" figure to Canadians. For "active" distributors, ACN discloses in a tiny-print link at the bottom of the page called "earnings statement" that in 2010 the "average" income was "approximately $500" a year (which is less than the cost of joining and participating). These absurd "income" numbers indicate why so many other MLMs offer no disclosures to USA consumers for due diligence use, and those that do inevitably concoct grotesquely misleading documents. Buy the "sales kit," with minimum or higher pricing options (investment-to-participate). Sign a binding contract (changing the signer's legal status and relationship to the MLM company from "consumer" to "contractor" and transforming all future purchases of company goods from negotiable, non-restricted transactions in the open market to closed-market, price-fixed, contract-defined purchases inside the company's restrictive "distributor" channel). Fulfill monthly product purchase quotas and renewal fees, among other costs (more investment-to-participate). Recruit others to do the same under a contractual promise from the MLM to pay rewards when new recruits' make future investments-to-participate. (Those rewards constitute ROI). This contractually-enforced commercial activity is called "duplication." MLM is the only type of business that employs it on a perpetual basis. The offer never ends and the price never changes, regardless of market conditions. Every day, millions of people are told the MLM proposition, based on perpetual"duplication", is their "last best hope" for security, prosperity, freedom and fulfillment, the answer to their prayers. The "duplication" plan producing the "unlimited" income opportunity is proclaimed as real and valid from speaker platforms across the land, delivered by (highly paid), famous celebrities, including Donald Trump, George W. Bush and Madeleine Albright at MLM-sponsored events; it is endorsed by (paid) major sports stars in stadiums and arenas; in the hallowed halls of Congress, veracity of the plan is sworn to by (paid) MLM lobbyists, including (paid) former commissioners and top officials of the FTC; it is devotedly whispered in church basements as God's plan and preached as "Prosperity Gospel" from some pulpits; it is desperately defended by recruiters on factory floors; dreamed about in Latino barrios and fervently believed by debt-laden students in college dorms. Its reality is "testified" to by anonymous websites everywhere online, confirmed on AM radio by trusted gurus such as Rush Limbaugh, and dutifully repeated by the mainstream news media as established fact. MLM is recession-proof. MLM is the remedy for joblessness, low pay, lack of education, involuntary retirement, student debt, family budget deficits, racial discrimination and immigrant status. MLM is the last and lone standard-bearer of the American Dream! All other income paths (jobs, higher education, professions, service careers, corporate work) are soul-killing, dead-end, or out of reach for the average person. The loss rate of those that invest in MLMs such as Herbalife, year by year, the "last ones in", is for all intents and purposes, 100%. This is verifiable. In Orwellian fashion, some MLMs have designed "disclosure statements" in such cunning, guileful formats, they are cited as proof of the "extraordinary" income opportunity. Only with careful, dissecting scrutiny and additional calculation is the truth of catastrophic failure rates revealed. It is one such public dissection and revelation of outrageous "disclosure" deception that prompted my decision to address these MLM documents. This is an extraordinary piece of investigative journalism published by, of all sources, ESPN. Seemingly against its own financial interests, ESPN challenged the legitimacy of lucrative national endorsements by major sports figures for the multi-level marketing company called Advocare International, which claims annual revenue of over $700 million in 2015. In 2013, none other than former president George W. Bush spoke at its recruiting rally, ironically called "Success School." I served as a volunteer resource to ESPN during its journalistic research of MLM and I am briefly quoted in the investigative article. Advocare is most famous for using sports star endorsements as primary evidence of the truthfulness of its income promise. Would a beloved football star lie to you? The national spokesman is the New Orleans Saints NFL football player Drew Brees. ESPN looked past the testimonials (sincerely delivered by Brees for payments and percentages on Advocare sales) to uncover the core reality of the Advocare "business opportunity." ESPN reported that Advocare had previously suffered a big revenue drop when the ingredient ephedra in its "weight loss" product (same ingredient was in Herbalife's) was banned by the FDA for causing heart attacks. The company's revenue began recovering only as the Great Recession set in and millions sought "income opportunity," not weight loss. But recruiting really took off when Advocare reinforced its income promise with major sports star endorsements claiming both magical health benefits and miraculous financial rewards to those that signed up. As it turns out and ESPN revealed, virtually no one makes a profit in the Advocare "business opportunity" of selling commodity shakes and supplements, certainly not the "last ones in" who are always the vast majority churning in and out year by year cheered on by NFL "role models" for youth. Advocare is not just any MLM. As the direct descendant and nearly perfect clone of Herbalife, it may be seen as prototypical. ESPN's experience with a classic MLM "disclosure" is archetypal for all other MLMs, especially the embattled Herbalife and Nu Skin. Advocare's now deceased founder learned the "MLM" business as a Herbalife recruiter so well he broke off to start his own MLM modeled exactly on HLF. It was called Omnitrition. That new company soon became known throughout the legal world for the famous class action lawsuit ruling in which the 9th Circuit Court of Appeals clarified the meaning of "retail" in MLMs, supporting the charge that Omnitrition was a pyramid scheme. Most of the revenue actually came from the salespeople themselves whose contractual purchases, the court determined, were not "retail." Omnitrition's "salespeople" personallypurchased the "health" products to become or to stay "qualified" for promised "commissions" flowing from the bottom to the top of an endless-recruiting-chain. Sound familiar? As the court ruled against Omnitrition, the founder moved on to form yet another version of Herbalife, this time called Advocare. Not surprisingly, products, policies and pay plans of all three, Herbalife, Omnitrition and Advocare, are uncannily similar. In its research, ESPN immediately encountered Advocare's version of the MLM consumer investment prospectus, the "income disclosure statement." It quickly determined that the most visible and prominently featured part of the statement - an income chart purporting to show the average "annualized" income of each of Advocare's 11 "levels" - made no mathematical sense. Other experts had warned ESPN it did not add up. It was therefore omitted from the ESPN story and its mysterious math was not addressed. Here's why. Advocare "discloses" that in 2014 it had 517,666 distributors overall, but only 154,819 "active" (made a purchase during the year). An equivalent distinction of the so-called "actives" is made in most MLM "disclosures to narrow down the "disclosure." It presents a chart with what it claims are the exact percentages of the "actives" in each of the 11 "levels," also a typical "disclosure" format. When the percentages are multiplied by the total number of disclosed actives (1 54,819), the exact number of participants in each level can be calculated, based on that chart. (Advocare, typical of all MLMs, omits this calculation from the chart). 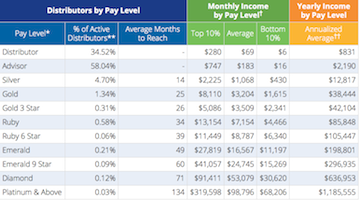 Advocare then offers an "annualized" mean average of incomes for each level (also typical). So, if the mean annual average of the level is multiplied by the number of distributors in that level, the total paid to that level is determined, based on the chart. And then if the totals paid to the respective levels are added together, this would be the overall total paid out.Right? Doing that calculation shows the distributors received over $800 million in commissions! That's more than the $700 million in total revenue the company reported to ESPN??? Then, on the same "disclosure" page, Advocare reports that the "average annual income for all active distributors" is $1,610. Okay, then if we multiply that overall mean average income by the disclosed total number of actives, (154,819) it should also provide the overall total payout and that should match the total paid to all the levels, according to the chart, right? The calculation shows a total payout of only about $250 million. That's just 31% of total revenue paid to the "levels," using the "annualized" averages. See the problem? This income chart, which ESPN omitted, is the main feature of the "disclosure" to consumers to support the claim that the "income opportunity" is real. The Advocare plan, like all other MLMs, depends upon new recruits being persuaded to move up a ladder level by level, and the increasing "income averages" posted on the chart are the financial carrots. ESPN opted to cite only data from Advocare's disclosure showing wide ranges of income categories, including how many people in total reached several minimum payment amounts in 2014. No overall payout totals can be inferred from that data. OMG! Just from examining that general data, and connecting a few data points ESPN discovered that 70% of all Advocare "distributors" earned zero from the company in 2014 and only 1% of all distributors, based on the total of 517,666, earned more than $5,000 a year, before taxes, quota-based purchases and all recruiting and selling expenses are deducted. ESPN revealed a devastating loss rate, but it was far from a true picture. Reality is actually much worse. Due to the mathematical contradiction of the Advocare income chart with the overall average and the lack of any historical data, ESPN was lured into the trap laid by all MLM "disclosures." It used the "disclosures'" generalized data that is frozen into a one-year time frame. It is like a presenting a fuzzy single-frame photo when a HD video is required. The one-year time frame only shows this year's participants. Last year's, the year-before-that's and all previous years' losers, who churned annually at 50-80% are omitted. Most participants in MLM do not last more than a year before quitting. The one-year freeze frame minimizes the ongoing and mounting scale of consumer losses. To further obscure the unfolding financial disaster, it includesin the one-year picture the cadre of professional recruiters who occupy more or less permanent positions at the top, year after year, presenting a false picture of annual "odds" for the last ones in. Basically, the same few people at the top are making money year after year while the masses of losing individuals below change year by year and keep piling up. The recruiters' inflated "incomes" then are factored in to boost the "overall average income" for the total. If only the "last ones in" during the year or the newest recruits of several years were tallied, not only would the percentage that made any profit among that group would be as close to zero as one could graphically illustrate, but also the "average income" would also be a virtual zero. Like any other new investor, what the new MLM recruit needs to know from a financial prospectus is how other recruits fared who invested recently or, alternatively, how many who ever invested are profitable? This data is always missing in one-year MLM "disclosures." If the full picture were disclosed, the term "income opportunity" would be revealed as a monstrous hoax. Here now is a list of eight special maneuvers used in MLM "disclosures" to conceal the terrible truth that there is no profit opportunity for new recruits year by year. 1. Conceal who Buys the Products and How Much is PersonallyPurchased or Sold by the Salespeople: Perhaps the most blatant and telling deception in MLM is to omit all "sales" data. This omission conceals how money is actually gained (recruiting, not personal selling, with most "sales" occurring inside the closed system). Imagine any other business in which the industry leaders claim they don't know who the ultimate customers are! And, when it solicits new distributors, the company won't reveal average distributor purchase or sales levels! These concealments are the rule at MLM. In a supposedly "direct selling" business, the averages of "direct sales" to personal customers are not revealed for any level on the chain. At Herbalife, for example, the "disclosure statement" does not reveal how much the Supervisors personally purchase or individually sell on average. Same for recruits below them. No data is given on total or average retail sales (customers outside the sales chain). Only "override" commissions generated from purchases made by other recruits inside the chain are disclosed as "income." Only those that successfully recruited other "contractors" are included in the count, but the company swears its business is not based on recruiting! 2. Use Skewed Mean Averages, never Median: Even more fabricated than the claim about "extraordinary" income is the spurious claim of an "average" income in MLM, creating the impression that the "average" new recruit gains at least some net income when virtually none does. Herbalife, for example, includes on its disclosure a figure of $5,456 for "leaders with a downline." The figure excludes 87% of all distributors because they earned zero from the company. But, even in that limited subset of "leaders with a downline," 73% of them earned less than $300 a year. So, how could the "average" income be $5,456? After excluding hundreds of thousands of "losers" from the count, Herbalife used a misleading "mean" average, factoring in the top-level recruiters' enormous gains into the "average." A closer reading of the data reveals only 1% of all Herbalife "distributors" gain more than $5,000 in a year, before all costs are factored. 99% are below the "average" with nearly all of them gaining zero. The median average (half make more, half less) compensation of all Herbalife distributors is zero. Even among the "Leaders" who pay as much as $3,000 for that position, the median average income is also zero or virtually zero since 47% received nothing. One more form of "averaging" trickery used by Advocare must be noted in conjunction with the skewed "mean" averages. Nu Skin and many others apply this same sleight of hand. It is the practice of "annualizing" monthly averages. With 50-80% annual turnovers of recruits, the vast majority of participants never receive any "annual" income. Yet, the chart seemingly shows the total numbers in each level receiving "annual" incomes. How? In the words of Nu Skin's "disclosure," the "annualized" figures "are calculated by taking the monthly average commissions and multiplying by twelve." What? The total of people in each level have nothing to do with the "annualized" calculation. Most did not even last one year in the business before quitting. Most got payments only for a few months or perhaps only one month. "Annualized" is a mathematical fiction, creating the grossly misleading impression of "annual payments" to the numbers listed in the respective levels and obscuring the meager few checks received by recruits before quitting and not offsetting their costs. 3. Maintain Only a Skewed and Misleading One-Year Time Frame so the Gains of the Top-Positioned Recruiters Are Included in "Annualized" Averages: Those at the top are more or less permanent. All others are a churning, replaceable mass of losing investors, whose numbers grow geometrically year by year. Yet, the one-year picture, limits the scale of the losses and then dilutes them by including the recruiter-elites. The percent of "earners" is therefore skewed positively when, in fact, the percent of newrecruits that earn any profit at all is effectively zero. Only if all who ever participated from the company's inception were included would the dilution effect be offset and true scale of loss be revealed. Then the shocking and almost unthinkable truth of such a calculated financial trap would emerge. 4. Exclude Economic Losers from "Income" Chart: Not surprisingly, Herbalife offers the same type of step-ladder chart that Advocare does, presenting "average gross payments," but limited to the "Sales Leaders with a Downline," excluding all others on the sales chain. The "percentages" offered for each income grouping are based on a tiny minority of the total and are therefore elevated. All others are left out. How many? 87%. Even those who coughed up as much as $3,000 to become "supervisors" but failed to recruit anyone are taken out of the chart. How many? 38% of the supervisors! They got reclassified as just discount shoppers. In fact, about half (47%) of the high-paying "Supervisors", received no company payments at all. At Nu Skin, it is even worse. Percentages in the Nu Skin "disclosure" are given only of the "active" distributors receiving a check, amounting to just 12.68% of the "actives." But buried in the disclosure narrative, it states, "Active Distributors represented an average of 41.61% of total distributors." Hold on! So those that got a check of any kind are 12.68% of 41.61%. That works out to 5% of the total! That's right. 95% got zero from the company. 5. Reclassify those that Fail as Self-Defined Winners or as Irrelevant to Income Disclosure: All recruits sign the same complex sales contract to become "independent contractors" and are subject to the same "non-compete," non-disparagement and many other legal restrictions; all pay a fee to join and are eligible for rewards; all are subject to the purchase quotas tied to rewards; all are legally identical. Nevertheless, those that make no income are misleadingly redefined as entirely different entities. Herbalife and all other MLMs redefine those at the bottom of the recruiting chain, based not on legal or financial status, but on "personal motivation" which the company claims to know. So, the 87% of Herbalife recruits that earn nothing from the company are said only to want discounts. They are called "customers" though legally they are "distributors." In this mythical world, no one on the chain loses since those that fail to gain income supposedly did not "want" income. They got a "discount," which is all they supposedly ever desired! Others who earn next to nothing are redefined as "part time" though neither Herbalife nor any other MLM has any direct knowledge of time invested by individual participants. 6. Hide the Punishing Top-Weighted Pay Formula that Transfers Most Commission to the Top: Not referenced in the "disclosure," MLM pay plans employ a unique formula that transfers more dollars - per transaction - to upper recruiters than to those making the sales transactions. The formula is in the "compensation plan" but literally incomprehensible in its complexity and opaqueness. Add to the top-loaded pay formula a policy of "compression" that exploits high dropout rates to transfer the fruits of lost labors upward. The result is that the majority of all commissions goes to the top 1% of the recruiting chain, not to the army of salespeople actually generating the revenue. At Nu Skin, 80% of all commissions wind up in the hands of the top 1%! At Herbalife, just among those classified as "sales leaders with a downline," which is the upper 13% of the entire sales channel, the top 1% of this group, only about 700 individuals in America, received over $206 million, an average of about $300,000 each per year. The bottom 89%, about 64,000 of the "leaders with a downline" received just $40 million, about $600 each per year. Is it possible that 700 sold five times as much as 64,000? Or that "sales" by the 700 would generate 500% as much in commission? No, the perverse pay plan is the reason, yet the disclosure would lead the recruit to view those at the top as "top salespeople." In fact, they are just beneficiaries of a radical bottom-to-top money transfer, not revealed on the "disclosure." 7. Withhold or Obscure the Devastating Churn Rate: Of all factors leading to quitting, the most often cited by disappointed MLM "losers" is that they could not find recruits or, among those that did, their downlines quit in droves. This led to their having to relentlessly recruit, just to stay even while also maintaining purchase quotas. Eventually, they too join the ranks of dropouts never to return and never to buy the MLM's goods again. Few MLMs even reference the punishing churn rate yet it is the largest single factor affecting the income proposition. Imagine a franchiser selling franchises to new investors without revealing the failure rate? Herbalife is one of the few that even obliquely references it on the Statement of Compensation. It is in a footnote at the dead bottom of the page in almost unreadable tiny print. It confusingly states, "58.2% of Sales Leaders as of February 1, 2014, requalified by January 31, 2015 (including 41.2% of first time Sales Leaders"). What does this convoluted syntax mean for "compensation"? It says that of those that just joined as Supervisors, costing about $3,000, 59% quit or fail to qualify by first year-end. 40% of the Supervisors in total, newest to join and veterans of more than one year, quit or are kicked off the rolls. Translating into simple math, if there are 1,000, 400 will be the newest recruits. In a year's time, 240 of the "last ones in" will quit (60%) and another 160 of the other will have left too. This goes on year after year. In just a few years, a near total turnover has occurred. If massive recruiting is not successful, total collapse from attrition will occur. What about the rank and file? The non-supervisors make up 80% of the "sales" force. In 2005, Herbalife's 10-K reported that 90% of this group "turns over" in one year! That number was never reported to the shareholders again. To dedicated recruiters, this means unless they can replace 80% of their "downline," virtually all past investment will be wiped out. This vital information is missing from the "disclosure." 8. Exclude Factors of Costs or Quota-based Purchases: Actual income over expenses is never revealed or even estimated, leaving an impression that "compensation", "commissions," etc. are "profit" or take-home pay. Though the costs of purchase- or recruiting-quotas are standard, amounting to hundreds of dollars a month, those expenditures are not reported. To make the deception official, mainstream news media dutifully quote the MLM's "average gross compensation" that is printed in the "disclosure" as "income average," as if most people actually get that amount or more (who admits to being "average"?). This fallacious "average" is offered without even estimating offsetting costs, and then the mythical "average income" is favorably compared to statistics for take-home pay at real jobs! The income proposition for Herbalife and other multi-level marketing companies is the engine the drives the business. It is presented as real by major authorities, for pay, and without evidence. Herbalife engages in deception in the promotion of its income proposition on such a scale and in so many ways the FTC has abundant regulatory means to cripple its recruiting. The primary tool of deception used by Herbalife, Nu Skin and other MLMs is the "income disclosure statement". Specifically, it is my conclusion, for which I will offer hard evidence here, that the major multi-level marketing companies, such as Herbalife and Nu Skin (NYSE:NUS), among hundreds of others, are engaged in appalling and calculated coverup, diversion and deception regarding the "income opportunity", in which they solicit millions of people to invest. This "income opportunity" is the engine of their businesses, making deception not just a marketing practice, but the very mission of the enterprise. No MLM is required to provide a prospectus when it solicits investments in the USA. The FTC, under Consumer Protection Bureau Chief, David Vladeck,exempted all MLMs from making any disclosures. Yet, for court-related or precautionary reasons, many MLMs do, including several of the major MLMs such as Herbalife, Amway, Nu Skin and Usana (NYSE:USNA). Their methodologies are the model for all others. Most MLMs take advantage of the legal exemption granted by the FTC and don't bother with disclosure trickery. They rely on absence of facts to support their recruiting promises. Avon, for example, offers no historical income information to USA consumers for its "business opportunity". Same for Tupperware in the USA, but it does in Canada, as required by law there. Tupperware's Canadian disclosure, when organized into readable data, reveals that the bottom 99% of its Canadian sales force received on average $11.49 per week, before expenses, and two-thirds of all annual commissions are awarded to the top 6%. Similarly, ACN, the MLM famously endorsed by Donald Trump, offers nothing for USA participants, but does offers an "average income" figure to Canadians. For "active" distributors ACN discloses in a tiny-print link at the bottom of the page, called "earnings statement" that in 2010 the "average" income was "approximately $500" a year, (which is less than the cost of joining and participating). These absurd "income" numbers indicate why so many other MLMs offer no disclosures to USA consumers for due diligence use, and those that do inevitably concoct grotesquely misleading documents. The loss rate of those that invest in MLMs such as Herbalife, year by year, the "last ones in", is for all intents and purposes, 100%. This is verifiable. In Orwellian fashion, some MLMs have designed "disclosure statements" in such cunning, guileful formats they are cited as proof of the "extraordinary" income opportunity. Only with careful, dissecting scrutiny and additional calculation is the truth of catastrophic failure rates revealed. It is one such public dissection and revelation of outrageous "disclosure" deception that prompted my decision to address these MLM documents. This is an extraordinary piece of investigative journalism published by, of all sources, ESPN. Seemingly against its own financial interests, ESPN challenged the legitimacy of lucrative national endorsements by major sports figures for the multi-level marketing company, called Advocare International, which claims annual revenue of over $700 million in 2015. In 2013, none other than former president George W. Bush spoke at its recruiting rally, ironically called "Success School." I served as a volunteer resource to ESPN during its journalistic research of MLM and I am briefly quoted in the investigative article. Advocare is most famous for using sports star endorsements as primary evidence of the truthfulness of its income promise. Would a beloved football star lie to you? 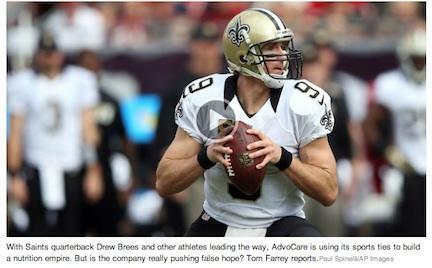 The national spokesman is the New Orleans Saints, NFL football player, Drew Brees. ESPN looked past the testimonials (sincerely delivered by Brees for payments and percentages on Advocare sales) to uncover the core reality of the Advocare "business opportunity." ESPN reported that Advocare, had previously suffered a big revenue drop when the ingredient, ephedra, in its "weight loss" product (same ingredient was in Herbalife's) was banned by the FDA for causing heart attacks. The company's revenue began recovering only as the Great Recession set in and millions sought "income opportunity", not weight loss. But recruiting really took off when Advocare reinforced its income promise with major sports star endorsements claiming both magical health benefits and miraculous financial rewards to those that signed up. As it turns out and ESPN revealed, virtually no one makes a profit in the Advocare "business opportunity" of selling commodity shakes and supplements, certainly not the "last ones in", who are always the vast majority, churning in and out year by year, cheered on by NFL "role models" for youth. Advocare's now deceased founder learned the "MLM" business as a Herbalife recruiter so well he broke off to start his own MLM modeled exactly on Herbalife. It was called Omnitrition. That new company soon became known throughout the legal world for the famous class action lawsuit ruling in which the 9th Circuit Court of Appeals clarified the meaning of "retail" in MLMs, supporting the charge that Omnitrition was a pyramid scheme. Most of the revenue actually came from the salespeople themselves whose contractual purchases, the court determined, were not "retail." Omnitrition's "salespeople" personally purchased the "health" products to become or to stay "qualified" for promised "commissions" flowing from the bottom to the top of an endless-recruiting-chain. Sound familiar? Here's why. Advocare "discloses" that in 2014 it had 517,666 distributors overall but only 154,819 "active" (made a purchase during the year). An equivalent distinction of so called "actives" is made in most MLM "disclosures to narrow down the "disclosure." It presents a chart with what it claims are the exact percentages of the "actives" in each of the 11 "levels", also a typical "disclosure" format. When the percentages are multiplied by the total number of disclosed actives (1 54,819) the exact number of participants in each level can be calculated, based on that chart. (Advocare, typical of all MLMs, omits this calculation from the chart). Advocare then offers an "annualized" mean average of incomes for each level (also typical). So, if the mean annual average of the level is multiplied by the number of distributors in that level, the total paid to that level is determined, based on the chart. And then if the totals paid to the respective levels are added together, this would be the overall total paid out. Right? Then, on the same "disclosure" page, Advocare reports that the "average annual income for all active distributors" is $1,610. Okay, then if we multiply that overall mean average income by the disclosed total number of actives, (154,819) it should also provide the overall total payout and that should match the total paid to all the levels, according to the chart, right? The calculation shows a total payout of only about $250 million. That's just 31% of total revenue paid to the "levels", using the "annualized" averages. See the problem? This income chart, which ESPN omitted, is the main feature of the "disclosure" to consumers to support the claim that the "income opportunity" is real. The Advocare plan, like all other MLMs', depends upon new recruits being persuaded to move up a ladder, level-by-level, and the increasing "income averages" posted on the chart are the financial carrots. ESPN revealed a devastating loss rate but it was far from a true picture. Reality is actually much worse. Due to the mathematical contradiction of the Advocare income chart with the overall average and the lack of any historical data, ESPN was lured into the trap laid by all MLM "disclosures." It used the "disclosure's" generalized data that is frozen into a one-year time frame. It is like a presenting a fuzzy single-frame photo when a HD video is required. The one-year time-frame only shows this year's participants. Last year's, the year-before-that's and all previous years' losers, who churned annually at 50-80%, are omitted. Most participants in MLM do not last more than a year before quitting. The one-year freeze frame minimizes the ongoing and mounting scale of consumer losses. To further obscure the unfolding financial disaster, it includesin the one-year picture the cadre of professional recruiters who occupy more or less permanent positions at the top, year after year, presenting a false picture of annual "odds" for the last ones in. Basically, the same few people at the top are making money year after year, while the masses of losing individuals below change year by year and keep piling up. The recruiters' inflated "incomes" then are factored in to boost "overall average income" for the total. If only the "last ones in" during the year, or the newest recruits of several years were tallied, not only would the percentage that made any profit among that group would be as close to zero as one could graphically illustrate but also the "average income" would also be a virtual zero. Here now is a list of eight special maneuvers used in MLM "disclosures" to conceal the terrible truth that there is no profit opportunity for new recruits, year by year. 1. Conceal who Buys the Products and How Much Is PersonallyPurchased or Sold by the Salespeople: Perhaps the most blatant and telling deception in MLM is to omit all "sales" data. This omission conceals how money is actually gained (recruiting, not personal selling, with most "sales" occurring inside the closed system). Imagine any other business in which the industry leaders claim they don't know who the ultimate customers are! And, when it solicits new distributors, the company won't reveal average distributor purchase or sales levels! These concealments are the rule at MLM. In a supposedly "direct selling" business, the averages of "direct sales" to personal customers are not revealed for any level on the chain. At Herbalife, for example, the "disclosure statement" does not reveal how much the Supervisors personally purchase or individually sell on average. Same for recruits below them. No data is given on total or average retail sales (customers outside the sales chain). Only "override" commissions, generated from purchases made by other recruits inside the chain are disclosed as "income." Only those that successfully recruited other "contractors" are included in the count, but the company swears its business is not based on recruiting! 2. Use Skewed Mean Averages, never Median: Even more fabricated than the claim about "extraordinary" income, is the spurious claim of an "average" income in MLM, creating the impression that the "average" new recruit gains at least some net income when virtually none does. Herbalife, for example, includes on its disclosure a figure of $5,456 for "leaders with a downline." The figure excludes 87% of all distributors because they earned zero from the company. But, even in that limited subset of "leaders with a downline," 73% of them earned less than $300 a year. So, how could the "average" income be $5,456? After excluding hundreds of thousands of "losers" from the count, Herbalife used a misleading "mean" average, factoring in the top-level recruiters' enormous gains into the "average." A closer reading of the data reveals only 1% of all Herbalife "distributors" gain more than $5,000 in a year, before all costs are factored. 99% are below the "average" with nearly all of them gaining zero. The median average (half make more, half less) compensation of all Herbalife distributors is zero. Even among the "Leaders" who pay as much as $3,000 for that position, the median average income is also zero or virtually zero, since 47% received nothing. One more form of "averaging" trickery used by Advocare must be noted in conjunction with the skewed "mean" averages. Nu Skin and many others apply this same sleight of hand. It is the practice of "annualizing" monthly averages. With 50-80% annual turnovers of recruits, the vast majority of participants never receive any "annual" income. Yet the chart seemingly shows the total numbers in each level receiving "annual" incomes. How? In the words of Nu Skin's "disclosure", the "annualized" figures "are calculated by taking the monthly average commissions and multiplying by twelve." What? The total of people in each level have nothing to do with the "annualized" calculation. Most did not even last one year in the business before quitting. Most got a payments only for a few months or perhaps only one month. "Annualized" is a mathematical fiction, creating the grossly misleading impression of "annual payments" to the numbers listed in the respective levels and obscuring the meager few checks received by recruits before quitting and not offsetting their costs. 3. Maintain Only a Skewed and Misleading One-Year Time Frame so the Gains of the Top-Positioned Recruiters Are Included in "Annualized" Averages: Those at the top are more or less permanent. All others are a churning, replaceable mass of losing investors, whose numbers grow geometrically, year by year. Yet, the one-year picture, limits the scale of the losses and then dilutes them by including the recruiter-elites. The percent of "earners" is therefore skewed positively when, in fact, the percent of newrecruits that earn any profit at all is effectively zero. Only if all who ever participated from the company's inception were included would the dilution effect be offset and true scale of loss be revealed. Then the shocking and almost unthinkable truth of such a calculated financial trap would emerge. 4. Exclude Economic Losers from "Income" Chart: Not surprisingly, Herbalife offers the same type of step-ladder chart that Advocare does, presenting "average gross payments", but limited to the "Sales Leaders with a Downline", excluding all others on the sales chain. The "percentages" offered for each income grouping are based on a tiny minority of the total and are therefore elevated. All others are left out. How many? 87%. Even those who coughed up as much as $3,000 to become "supervisors" but failed to recruit anyone are taken out of the chart. How many? 38% of the Supervisors! They got reclassified as just discount shoppers. In fact, about half (47%) of the high-paying "Supervisors", received no company payments at all. At Nu Skin, it is even worse. Percentages in the Nu Skin "disclosure" are given only of the "active" distributors receiving a check, amounting to just 12.68% of the "actives." But buried in the disclosure narrative, it states, "Active Distributors represented an average of 41.61% of total distributors." Hold on! So those that got a check of any kind are 12.68% of 41.61%. That works out to 5% of the total! That's right. 95% got zero from the company. 5. Reclassify those that Fail as Self-Defined Winners or as Irrelevant to Income Disclosure: All recruits sign the same complex sales contract to become "independent contractors" and are subject to the same "non-compete", non-disparagement and many other legal restrictions; all pay a fee to join and are eligible for rewards; all are subject to the purchase quotas tied to rewards; all are legally identical. Nevertheless, those that make no income are misleadingly redefined as entirely different entities. Herbalife and all other MLMs redefine those at the bottom of the recruiting chain, based not on legal or financial status, but on "personal motivation" which the company claims to know. So, the 87% of Herbalife recruits that earn nothing from the company are said only to want discounts. They are called "customers" though legally they are "distributors." In this mythical world, no one on the chain loses since those that fail to gain income supposedly did not "want" income. They got a "discount", which is all they supposedly ever desired! Others who earn next to nothing are redefined as "part time" though neither Herbalife nor any other MLM has any direct knowledge of time invested by individual participants. 6. Hide the Punishing Top-Weighted Pay Formula that Transfers Most Commission to the Top: Not referenced in the "disclosure," MLM pay plans employ a unique formula that transfers more dollars - per transaction - to upper recruiters than to those making the sales transactions. The formula is in the "compensation plan" but literally incomprehensible in its complexity and opaqueness. Add to the top-loaded pay formula a policy of "compression" that exploits high dropout rates to transfer the fruits of lost labors upward. The result is that the majority of all commissions goes to the top 1% of the recruiting chain, not to the army of salespeople actually generating the revenue. At Nu Skin, 80% of all commissions wind up in the hands of the top 1%! At Herbalife, just among those classified as "sales leaders with a downline", which is the upper 13% of the entire sales channel, the top 1% of this group, only about 700 individuals in America, received over $206 million, an average of about $300,000 each per year. The bottom 89%, about 64,000 of the "leaders with a downline" received just $40 million, about $600 each per year. Is it possible that 700 sold five times as much as 64,000? Or that "sales" by the 700 would generate 500% as much in commission? What does this convoluted syntax mean for "compensation"? It says that of those that just joined as Supervisors, costing about $3,000, 59% quit or fail to qualify by first year-end. 40% of the Supervisors in total, newest to join and veterans of more than one year, quit or are kicked off the rolls. Translating into simple math, if there are 1,000, 400 will be the newest recruits. In a year's time, 240 of the "last ones in" will quit (60%) and another 160 of the other will have left too. This goes on year after year. In just a few years, a near total turnover has occurred. If massive recruiting is not successful, total collapse from attrition will occur. What about the rank and file? The non-supervisors make up 80% of the "sales" force. In 2005, Herbalife's 10K reported that 90% of this group "turns over" in one year! That number was never reported to the shareholders again. To dedicated recruiters, this means unless they can replace 80% of their "downline", virtually all past investment will be wiped out. This vital information is missing from the "disclosure." 8. Exclude Factors of Costs or Quota-based Purchases: Actual income over expenses is never revealed or even estimated, leaving an impression that "compensation", "commissions", etc. are "profit" or take-home pay. Though the costs of purchase- or recruiting-quotas are standard, amounting to hundreds of dollars a month, those expenditures are not reported. To make the deception official, mainstream news media dutifully quote the MLM's "average gross compensation" that is printed in the "disclosure" as "income average", as if most people actually get that amount or more (who admits to being "average"?). This fallacious "average" is offered without even estimating offsetting costs, and then the mythical "average income" is favorably compared to statistics for take-home pay at real jobs! Robert FitzPatrick shows 'MLM' growth is finished. Apart from fraud charges, the global performance of Herbalife and other large MLMs shows their era of "growth" is over. The change is not cyclical, but inevitable and irreversible. Growth in MLM is not real. It relies on new geography. There is no sustained base of brand loyalists or successful salespeople. For individual recruits, MLM "growth" from recruiting is a requirement. No one profits by personal "direct selling." While expansion is always promised, data now show contraction, revealing to regulators and investors MLMs inherent flaw and its basis in deception. Herbalife, Nu Skin and Usana illustrate the reality of saturation. All depend now on China and other new markets, the proverbial "last ones in." China "growth" is ending. Using global and domestic SEC-reported data, I have previously published articles tracking and evaluating the "growth" and "saturation" status of the commercial sector known as "multi-level marketing", MLM. Recently released data from Herbalife (NYSE:HLF) most clearly illustrate the new reality of the end of the MLM "growth" era, and this nothing to do with the recent controversies of fraud charges against Herbalife. The MLM sector includes global companies, Herbalife (HLF), Nu Skin (NYSE:NUS), Usana (NYSE:USNA) and Avon (NYSE:AVP), among about 10 others on Wall Street. Its largest private representative is Amway, the progenitor of all current MLMs. Avon predates Amway as a company but adopted the Amway-model only after 2000, and only partially. There are now perhaps over 1,000 MLMs in the USA! After years of confusion on Wall Street, it is now widely accepted that "MLM" is a distinct sector, though its definition and legal status are still contested. It is widely understood that, whatever MLM is, the common denominator of the sector is a shared commodity of human recruits who operate under essentially identical legal contracts, unique to MLM and who serve as the direct and ultimate source of almost all revenue. This common revenue source is gained by inducing the recruits to seek financial rewards tied to the hallmark MLM "business opportunity." This shared and virtually identical "business opportunity" offered by all MLMs always depends upon recruits recruiting other new recruits in a classic "endless chain" proposition. In putting all MLMs together under one sector, it is implicitly understood that the various consumer products offered for sale and their unadvertised brands do not characterize or define individual MLMs. The various products (usually pills, potions and lotions) are merely incidental elements of the shared recruiting and money transfer mechanism. As to the legitimacy of MLM'sdefining pay-to-play, contractor-recruiting-contractor, endless-chain model, Wall Street generally embraces it but presumably only as long it continues to "grow." For a full economic and philosophical endorsement of the MLM business model see the booklet by a Dr. Lasdwun Luzes who boldly lays out the case, In Defense of the Pyramid Scheme. I will publish a comprehensive summary of 5 years of data of publicly traded MLMs, from year-end 2010 with analysis of the demographic and information saturation factors when SEC reports are available. However, 2015 data already reported by several of the largest MLMs support my earlier analysis that the heyday of MLM is finished, never to return. There will never be another MLM ballooning to the size that some of today's MLMs reached a few years ago. This 35-year MLM pandemic occurred while the FTC deliberately ignored it or administratively dithered over arcane definitions of "pyramid scheme" and some FTC officials strolled through the lucrative revolving door between the FTC and the MLM "industry." Free from law enforcement, MLM's recruiting rampage carried this American racket to every corner of the globe, with China as the last stop. Now, in the face of global saturation, based on growing public awareness and demographic limits, the larger MLMs can no longer claim "momentum" and "explosive" growth to lure in recruits. The current challenge of these companies today is to manage unfolding collapse while still promising "unlimited income" to new recruits. Amway, the oldest MLM with the longest global reach, reports (unverified, since it is a private firm) its global revenue has recently dropped to its lowest point in 5 years. The decline appears to be accelerating, moving from minus 8% in 2014 to minus 12% in 2015. Much of the decline occurred, Amway claims, in China, which had accounted for the previous spike. Avon, the MLM with the largest number of members, suffered a 34% revenue drop since 2010 (including North America revenues in 2015) and has just sold off its entire North American operation, where the company began over a hundred years ago.MLMs classically saturate earlier markets, requiring constant expansion for "growth." Investors who still hearken to MLM's historic and enigmatic "growth" rates, even in the middle of global recession, should take note that this recent reversal of fortune is not cyclical but inevitable and irreversible. "Growth," as it is conventionally understood, must be put in quotes when referencing MLM because MLMs misuse the term to confuse consumers and investors as part of an entire vocabulary of pseudo-business terms and phrases, including the meaningless term, "multi-level marketing" itself ("multi" actually means infinite). I see firsthand how effective this linguistic flim-flam has been in sowing confusion from talking with countless MLM participants, providing professional consulting to dozens of Wall Street analysts on MLM, and being interviewed by journalists assigned to report on this or that MLM stirring up local discontent across the world. Consumers cannot discern the indecipherable MLM play plan and are not told of MLM's epic turnover rates among recruits. Without a good grasp of algebra few can untangle the misleading "income disclosures" - among the few MLMs that offer them at all - revealing 99% loss rates. Aiding and betting the concealment and NewSpeak, the FTC specifically exempted MLMs from all financial disclosure requirements as they solicit investments from millions of people each year. Wall Street researchers, charged with due diligence on behalf of investor groups, earnestly try to apply conventional metrics to MLM in the naïve belief that MLMs compete and grow like real companies. They imagine MLMs gaining customers from competitors with similar products or creating new markets that add to an existing year-upon-year base of brand loyalists. They further imagine that new customers are won over by profitable salespeople who sell products based on market factors like pricing, quality, technology advantage or some valuable differentiation, resulting in profit to them and "growth" to the MLM enterprise. Yet, these researchers are invariably flummoxed to explain a seemingly inexplicable factor that contradicts their "sales" thesis. This is the extraordinary attrition among adherents, reaching virtually 100% in several years. After signing contracts and paying fees, why would salespeople or even customers abandon a "growing" company with loyal buyers in such numbers and so rapidly? To reconcile the mysterious phenomenon, they bravely search for other market-based factors like variations in start-up fees. For investor purposes, analysts do their best to exclude deception and fraud as factors. They must do this in the face of otherwise inexplicable consumer behavior, massive consumer loss rates, cult marketing techniques by MLMs and continuous churning of what they define as "salespeople" and "customers" without being able to determine exactly who is selling to whom or what the real products are. In reality, none of these market-based factors applies or has anything to do with growth or decline in MLM. Quitting rates turn out to be the same across the board, having nothing to do rational buying, fee levels, or diligent investing. Indeed, conscious buying or investing "choice" isimpossible in MLM since no one is ever fully or adequately informed when recruited. MLMs sell anon-existent income opportunity. Therefore, conventional sales and marketing laws and definitions that govern real commerce, in which actual value is exchanged, do not apply. In describing the marketed MLM "income opportunity", I call it "non-existent" not editorially but based on a tedious analysis of the bizarre MLM pay formulas that transfer most commission dollars, per transaction, to the top of an enormous recruiting chain, and impose burdensome pay-to-play purchase requirements on new recruits, serving as the chief revenue source. My description is further supported by de-constructing the available income disclosures that reveal 99% loss rates among all MLM adherents, year in and year out, including those who pay the much higher fees to start out at higher potential pay rates. Here's a test, requiring only arithmetic, that should settle all question about the existence or absence of an MLM "income opportunity." Take any of the larger MLMs and add together all the people that have ever paid money to become eligible for the fabled "income opportunity", dating from the company's inception, and then ask how many or what percentage of all of them ever did earn a profit or are gaining it now. No one does this in the media or on Wall Street, perhaps because the answer would be too shocking to accept. Hundreds of millions of people, over three decades were obviously churned through a mill of false income promise only to "fail." Even those the MLMs claim are only "discount buyers" universally disappeared. A tiny cadre of recruiters at the top profit directly from those losses, year in and year out. Yet, millions more are still successfully recruited? The specter of commercial deception on such a scale, while the FTC looks on, is literally unthinkable for some analysts and reporters, much less ordinary consumers. Referring to growth, I employ the phrase, "as it is conventionally understood," because MLMs do not grow according to how that term is conventionally used in business. MLMs that "grow" are only outpacing attrition each year. There is no large base of salespeople or customers upon which to "grow." There are no loyal or repeat customers of any consequence. Only if recruiting outpaces attrition, can revenues be larger YOY. The sales force and the customers did not grow. They were replaced. Collapse occurred more slowly than recruiting accelerated, and the scheme was thus able to give an outward appearance of organic growth, unless one looks more closely. Real growth requires success and satisfaction of earlier buyers and salespeople. MLMs, however, leave almost total failure, abandonment and disappointment in their wake. Before citing more of the available company data and their significance, it is important to consider the meaning of MLM's recently arrived at "no-growth" status from the consumer' interests, not just the investors'. A no-growth conventional company can obviously remain profitable and valuable to customers. However, in MLM, growth is not a market condition; it is a promise on which value-for-payment-received is based. It is therefore an existential requirement. But, without capacity for outpacing collapse, MLMs now have no basis at all for claiming that new recruits have a chance at success and therefore cannot plausibly pretend to offer value in exchange for payment. Let us be clear in recognizing that individual success in all MLMs is not based on personal sales or "direct selling" as it is called. In 15 years of work in MLM, I have not found an individual who earned sustainable profit without recruiting other recruiters. No one in MLM has or does gain sustainable profit from individual door-to-door selling, an outmoded and unnecessary method of product distribution. Add in absurdly high prices, an upside-down commission plan that rewards the recruiter and oppresses the street-level retailer, unprotected territories, constant inundation of competitive salespeople, no advertising allowed, punishing inventory purchase requirements, and the MLM "direct selling" business is revealed as an utter sham. MLM "growth" is not an added benefit but a requirement, since 50-80% of the entire sales force and customer base (for the most part, one and the same) disappear annually and the remaining market shrinks. Yet, for any significant number of new recruits to succeed, the overall chain must get larger and longer. It is this contradiction that leads to the conclusion of many experts that the business model is "inherently" unsustainable and deceptive. An MLM enterprise can thrive only on the failure of its churning and "losing" adherents. Up to recent times, geographic expansion and brief periods of local increases in prospects, usually brought on by economic distress, could at least mimic sustainable growth or perhaps support the claim that recruiting could alwaysoutpace attrition, giving some recruits a chance to "win" though at the expense of their recruits. But, if revenue records show local and globalcontraction, on what basis can the MLM company base even a bogus promise to the "last ones in" of viable profit opportunity based on "infinite" recruiting? Properly understood, the new status of no-growth-due-to-saturation lays bare the realities of MLM for regulators and investors who might still be charmed by MLM's historic "growth", promises of perpetual growth or the newest predictions of return to growth. It has already been shown that MLM's greatest icons, Amway and Avon, have experienced dramatic drops in revenue recently. Nu Skin, also one of the larger and older MLMs, serves as a further illustration of the trends in maturity and reveals "growth" as merely a reflection of the "last ones in." 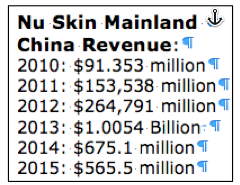 Nu Skin's China "growth" exploded almost 400% between 2012 and 2013, catapulting China to Nu Skin's largest market and accounting for 32% of total revenues. Then in just two years, revenue was nearly cut in half. Between 2013 and 2015, Nu Skin's global revenue dropped by $929.7 million. The drop in one market, China, accounted for about half of that global drop. Usana is a commercial clone of Nu Skin, both enterprises coming out of Utah, that font of MLM startups and "food supplements." In saturation status it is only a year or so behind Nu Skin before hitting the China Wall. Extreme slowdown has already been reached. Consider the drastic change in rates reflected in language in the end of Q4 8Ks of 2014 and 2015. In 2014, Usana trumpeted net sales growth in Asia Pacific (including mainland China) of 34.1% compared to same period a year before. It also added that it achieved a 25.4% "sequential" increase over the 3rd quarter of that year. This is the classic MLM "exponential" growth achieved with mesmerizing and illusory endless chain incentives offered to virgin recruits in newly invaded territories. A year later, there is no bragging of a sequential increase. It had dropped to just over 2% and annual "growth" for the quarter was just 5.4% over the same period a year ago. Between 2013 and 2015, Usana "grew" by $200.5 million globally, now edging close to a billion in total revenue. But during this same time frame, it "grew" in Greater China by $169.47. China, a market that Usana only recently entered, accounted for 85% of Usana's global "growth" in the 2013-2015 period. It opened in mainland China with an entirely new line of goods from a small, obscure China-based company selling "baby" products in a country that limits families to one child! Yet, with a new product, in a new land, Usana reports that Greater China is now approximately half the company's total global revenue! Breaking it down even closer, reveals thatUsana is dropping in the areas of Greater China where it entered first, like Hong Kong. Go figure. Analysts may deduce that all the rest of the world, accounted for only 15% of Usana's "growth" in the last two years. Excluding Greater China, Usana grew just 4% in the last two years. China, the "last ones in", sustained the company and enabled it to tell hopeful recruits in all other countries that it was explosively "growing", though in many places, even its home country, the USA, it was actually in contraction. Unless you have cousins in China, the actual data showed that the chance of your building a large local downline based on friends and family, ignoring the financial consequences to them, was bleak indeed. Analysts that question the sustainability of Usana's earlier rocket-like growth (almost entirely in China, it turns out) might want to know of Usana's performance in the USA, where it all started. Shouldn't this be the strongest area, where it is best known, faces no currency "headwind" and should have the largest base of satisfied adherents over more than 20 years of operation? This is a question I have special interest in since "saturation" in MLMs occurs in earlier markets where demographics and actual failure rates finally take their toll. It turns out that Usana makes it difficult to know for sure USA revenue and recruiting status. Is the "drop" concealed while the "pop" is touted? The reported data does show steady but modest declines in the USA revenue, -10%, while mainland China grew +332%, but, incredibly, Usana has confused the definition of "USA." In 2000, Usana began merging parts of Europe's data with the USA's. From Usana's Q-2, 2000, "Since the beginning of the second quarter of 2000, the Company's United Kingdom market has been serviced from the United States and Is no longer an operating segment of the company. The company's operating segments are based on operating geographic regions." Usana reported in Q1 2012: "North America - United States (including direct sales from the United States to the United Kingdom and the Netherlands), Canada, Mexico, France(1), and Belgium(1) … The Company commenced operations in France and Belgium during the last week of the first quarter of 2012. Net sales and customer count information for these two markets have been included with the United States for the quarter ended March 31, 2012." Say what? Europe is counted with North America for net sales and customer count? And Usanais adding new countries in Europe, making "North America" an expanding market? The seemingly modest and gradual decreases in the "USA" that Usana reported to the SEC are contradicted by Usana's income disclosure reports to consumers, not to the SEC. These disclosures are based only on the real North America, not a fictional one presented to shareholders and the SEC. In its North American Average Total Earnings for 2011 the total of USA Associates that purchased at least one product (active) was reported as 135,590. Then, when Usana updated this USA data disclosure with 2014 data, only for geographic North America, Usana reports only 61,400 associates qualified as active by making one purchase. That's a 54.7% domestic decline in three years. Shareholders seeking insight into Usana'sfuture, especially its future in "explosive China" may want to know exactly how Usana is doing in the 50 states of the USA, really. It is the harbinger for China. Herbalife: China and Latinos Sustain the Illusion of "Growth"
Herbalife came into being two years after a controversial FTC decision reversed earlier rulings against MLMs and allowed Amway's pyramid plan to continue, based on its sworn testimony that it was a retail sales company, not a recruiting scheme. Herbalife cloned the Amway play plan and after 20 years of operation, Herbalife entered the China market in 2001, one of the earlierMLMs to go there. Now, after just 14 years in China, revenue from that country is almost entirely sustaining Herbalife, offsetting saturation in most of the rest of the world, including the USA, its home market. Between 2013 and 2015, Herbalife declined in global revenue by $142 million. But in the same period revenue "grew" in China by $370.9 million. Excepting for increases in China, Herbalife's global revenue would have dropped over 9% in the last two years instead of -0.34%. As with Amway, Nu Skin and Usana, China is Herbalife's "last ones in," keeping afloat any claim at all for "growth." In the last five years, Herbalife's reported annual revenue increased by $1.7 billion. 38% of that "growth" occurred in mainland China alone and at the same time, Herbalife entered 16 other new countries, adding to the "growth." Without geographic expansion,Herbalife's is in significant decline, but it is now running out of new countries. Between the end of 2012, when scrutiny was focused on Herbalife by the Pershing Square fraud thesis presentation, global revenue "grew" by $397.7 million, while China alone grew by $567.7 million. If you take out the China "growth", (increase in China only) during these three years of controversy, Herbalife global revenue, would show a negative 4%. Even with China and other new countries entered, Herbalife still showed global revenue decline in the last two years. If globally Herbalife is dependent on China, in the USA, it is clinging to the lifeline of Latino immigrants, a virtually new country it invaded inside the USA to offset information and demographic saturation among the rest of the population. Yet, despite this new base of vulnerable recruits, revenue declined in the USA over the last two years after spiking upon a massive and customized recruiting campaign aimed at low income Latinos and other new immigrants.